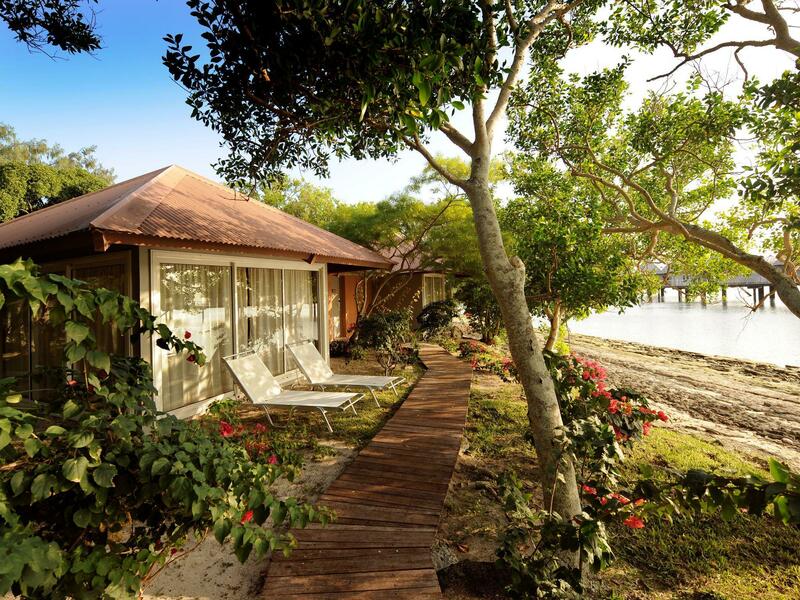 للمسافرين الذين يرغبون أن يعيشو كل ما تقدمه نوميا, L'Escapade Island Resort هو الخيار الأمثل. يسهل الوصول إلى هذا الفندق ذو 3 نجوم من المطار، فهو يبعد عنه مسافة 50KM فقط. إن سهولة الوصول من الفندق إلى المعالم السياحية الشهيرة الكثيرة في المدينة كمثل Aquarium, ‪Aquarium des Lagons Nouvelle Caledonie‬, جليزي اتيتيود هو استثنائي بحد ذاته. يعمل L'Escapade Island Resort على ضمان إقامة مريحة لضيوفه من خلال خدماته الممتازة وحسن ضيافته. يمكن للنزلاء الاستمتاع بالميزات التالية: معبد, خدمة التنظيف يوميًا, متجر هدايا/تذكارات, مكتب الاستقبال على مدار الساعة, تخزين الأمتعة أثناء إقامتهم في هذا المكان الرائع. تتضمن كل غرف النزلاء وسائل الراحة والتسلية المصممة خصيصاً لضمان الراحة القصوى للضيوف. سواء كنت من محبي الرياضة أو كنت تتطلع لتفريغ عناء نهار صعب، ستجد خدمات ذات مستوى عالي بانتظارك كمثل قوارب, كنو, تأجير معدات الرياضات المائية, الغوص السطحي, حمام سباحة خارجي. مهما كانت دواعي سفرك فإن L'Escapade Island Resort هو خيار ممتاز لإقامتك في نوميا. We had an overwater bungalow and I recommend everyone try that for once in their life. I recommend a 4-5 night stay. At 3 nights, we wished we could have had at least one more. Amazing snorkeling, powerful jet skis and great massage . Bring food/drink with you. The midweek (cheap) price per person for dinner is $55usd for a decent buffet and beers are at least $10usd. Staff on island are great. Staff on boat/land are largely indifferent to your existence. Food quite expensive and no real shop, make sure you take snacks with you. The coral reefs were great for snorkelling, we would see 5/6 turtles each day. Only really buffet available which was very expensive. Tapas were more like basic bar food on offer. The resort was a bit tired and I requested a bottle of wine and flowers for our arrival as it was a special anniversary but nothing was in the room so it was disappointing. But still a very relaxing stay when you get used to the snakes and spiders. Great island getaway. We stayed in the bungalow and was just what we were looking for. Reefs were great for snorkeling and we got to see all kinds of underwater wildlife. We also went in the off-season and we were able to get a late check out, which gave us extra time to enjoy a few more hours. Price was reasonable for the atmosphere and would definitely recommend to others. 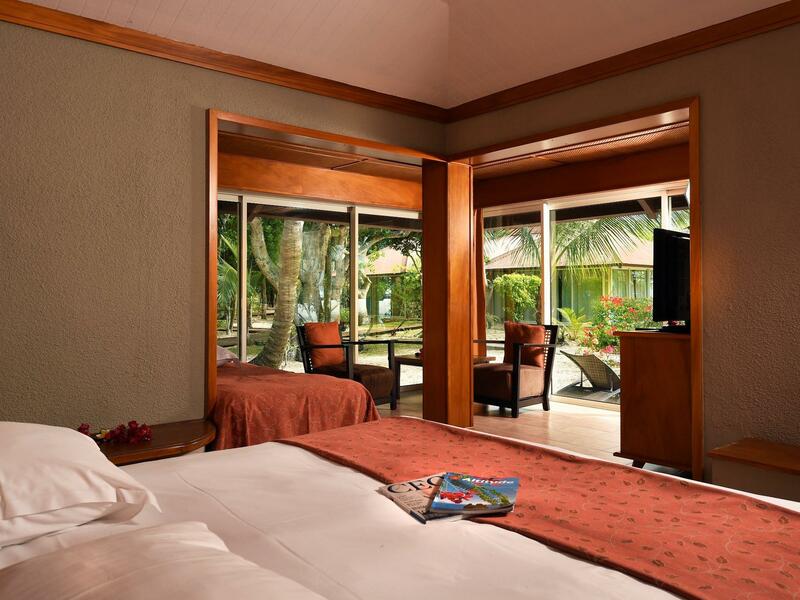 Great spacious room, amazing view over the ocean and really friendly and accommodating service. I stayed at one of the rooms over the sea and it was incredible. I think staying in the 'garden view' style rooms would be a bit wasted on this island with such stunning vistas. It was peaceful, the staff were always accommodating but never overbearing and dinner and breakfast were first class with most items made in house. Transport to the island was easy and the water was warm and ideal to swim in. There was not enough to do. Snorkelling and water craft were available (water craft extra money), but very little else. If the weather is bad, like we experienced, there really isn't anything to do. A resort needs to offer at least a gym so some sort of exercise can be accomplished. The very worst thing though is the poor quality of food and the exorbitant price you are forced to pay. There is only one place to eat and it is a smorgasbord every night. Very little variation from night to night. In fact, we wondered how much food from the night before was there. The same pot of soup was certainly the same for a few nights in a row, The cost of the smorgasbord is about $A80 per person. We even had to pay extra for tea or coffee at dinner, about $A7 per cup. There was no alternative. There were snakes everywhere! Even snakes climbing the steps to the over water bungalows. We were so disappointed by our whole experience. 1 or 2 nights stay at the most and be prepared to pay exorbitant prices for everything. Take lots of books to read. We felt very ripped off. reat location for over the water bungalo but only stay for 3 nights - the island is small and buffets are a bit pricey for the quality - don;t get me wrong, food was edible; the resort is staffed at a low level and they let folks visit from minland by day too. The agoda ad said transfers included but the resort only provided wtare transfer from port to island an dback - not airport to port. it was an enjoyable stay. our room was right next to the beach. reasonable price for such a private island and resort. only thing was why was there 3 beds in a room? we reckon it was for private massage. 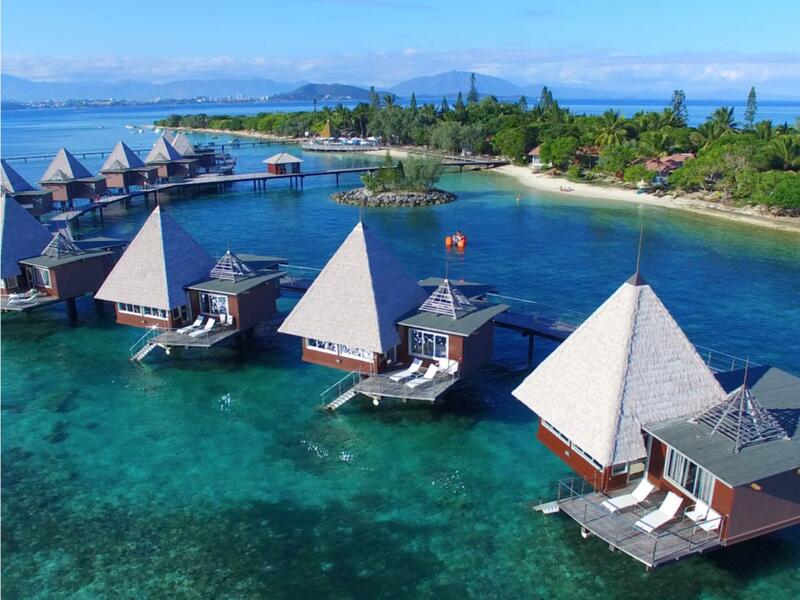 totally recommend this resort for stay if you're heading to Noumea! Staff was pleasant, although they don't necessarily understand you due to language barrier. The hotel is simply fantastic. Great location, smacked in a private island and beach. It's the perfect getaway spot, a breakaway from the hustle and bustle of city life and perfect for honeymooners. Best hotel in Noumea, without a doubt! One setback is you could only dine in the resort, which means you have no choice but to have their buffet breakfast and dinner other than doing room service. We find the food lack variety and quality for the price you're paying. We enjoyed the overwater bungalow - living room, bedroom and toilet are spacious with balcony to chill and lookout for sunsets. You could also jump off anytime for snorkel. Waters are crystal clear! We had a wonderful relaxing break at L'Escapade - reception staff and the manager at the activities centre were all very friendly. A quiet, isolated place to just relax and refresh. spent a week there and loved the location. i was looking for a place to just 'crash' after a lot of international travel and this place was perfect. but while the accommodations are very good, the food and service leave much to be desired. the meals are all buffet and are very expensive for the quality. bar drinks are similarly overpriced for what you get - usually a poorly mixed cocktail. Un séjour parfait pour un couple, d'une durée d'un week-end soit 2 nuitées. Le bungalow , la nourriture, le personnel est tip-top. Mis appart quelques petits problème magnétique au niveau de la clef de chambre, ainsi que l'attente pour faire le c/out (près de 15min), ainsi que la facture du départ qui n'est pas très compréhensible ainsi que les tarifs afficher en € . Prix assez élevées .. Un endroit magnifique, pour regarder le lever & le coucher de soleil.